I’m not a big apple fan. I don’t really like apple pie or apple strudel or apple crumble or apple fritters. Are you cursing at me through your computer screen yet? The experimenter in me wants something outside the box and apple is just so classic, so ordinary. Although it is my last choice, I live with a big apple fan. He loves it so much that we have an apple cinnamon scented Glade plugin in our living room right now that tempts me to gag whenever I walk past it. Gross. Anyway, I wanted to make a batch of muffins to have on hand to throw into lunches and breakfasts last week but we didn’t really have much for fruit around. We did have a few trusty apples though, so I bit the bullet and made an apple cinnamon version of my favorite muffin recipe that I usually reserve for berries or rhubarb (or anything not apple). You know what? I was pleasantly surprised when I tried these. They aren’t crazy apple-y, just sweet and moist and the buttery streusel on top really makes them. If you are an apple lover, I bet you’ll appreciate them even more than I did. Mix dry ingredients in a medium bowl and set aside. Mix wet ingredients together in the bowl of a stand mixer. Mix dry ingredients in with wet ingredients, being careful not to over mix. Stir in apples. Batter will be very thick. 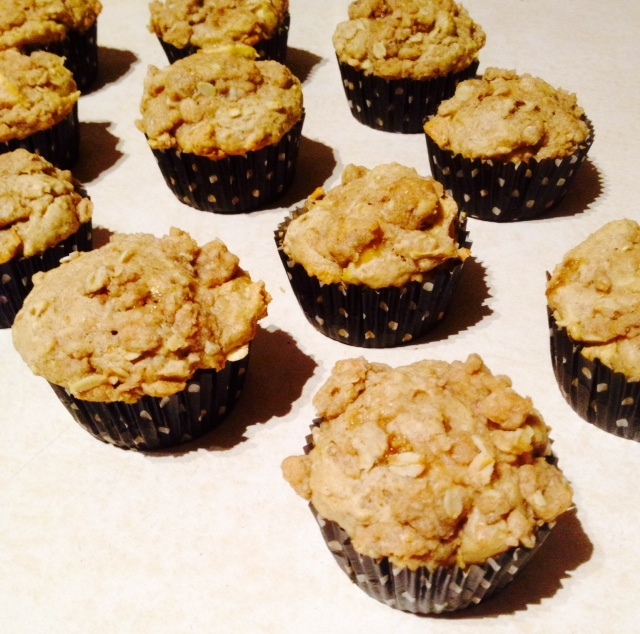 Pour into muffins liners and divide streusel evenly on top of muffins. Bake for 18-20 minutes. Once cool, store in an airtight container. These also freeze great.